BANGI, 16 August, 2010 –The Deputy Vice Chancellor (Academic and International Affairs), Universiti Kebangsaan Malaysia (UKM), Prof. Dato’ Ir. 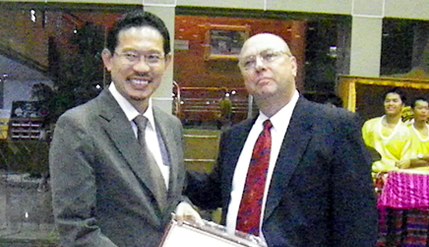 Dr Hassan bin Basri,was recently internationally honoured when he was conferred the “Outstanding Professor” award by three International organisations. The award was given to him by the Association of Organisational Innovation (IAOI), International Conference of Organisational Innovation (ICOI) and International Journal of Organisational Innovation (IJOI) at a ceremony at the Siam University in Bangkok on Aug 4. The award was conferred based on Prof Hassan’s many years of contribution to the IAOI and the conference series and journal sponsored by them, i.e. the Annual International Conference for Organisational Innovation (ICOI), and the International Journal of Organisational Innovation ( IJOI). The award was also given in recognition of Prof Hassan’s achievements in academic leadership, both in UKM and the engineering education community in Malaysia and the region. Prior to his current appointment Prof Hassan had served as Dean of the Faculty of Engineering (2000 – 2007), Head of Civil Engineering (1996-2000), Director, Centre for Research & Innovation Management (2007-2008) and Director, Centre for Corporate Planning & Communications (Feb-August 2008). As Chair for both the Engineering Accreditation Council and the Malaysian Council of Engineering Deans, Prof Hassan played a key role in the transformation of engineering education in Malaysia. This was critical in securing Malaysia’s entry into the Washington Accord, the prestigious international agreement for mutual recognition in the accreditation of engineering degree programmes.